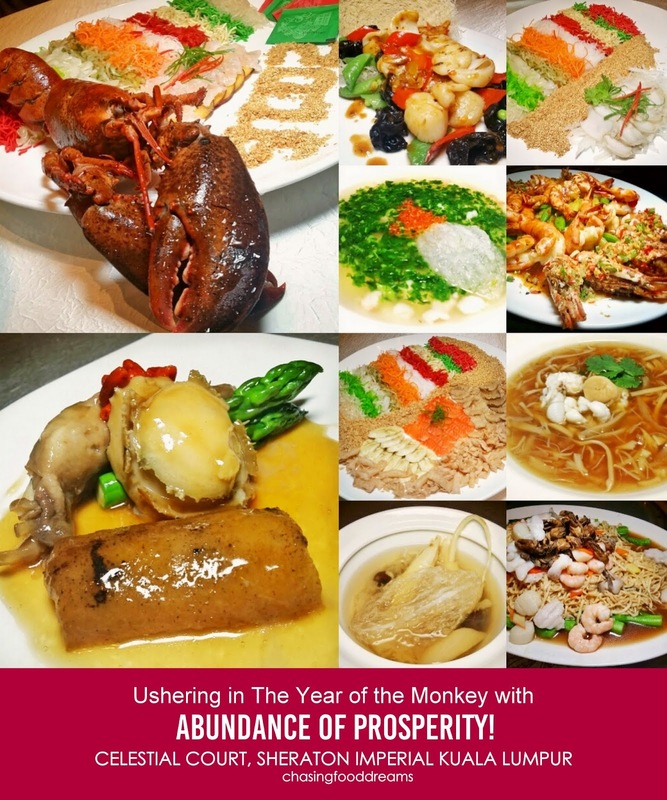 Ushering in the Year of the Monkey with Abundance of Prosperity! Looking for indulgence at its finest, check out Celestial Court at Sheraton Imperial this New Lunar Year to feast on a mouth-watering menus fit for royalty. Ushering in the Year of the Monkey, Celestial Court goes all out to create festive menus filled with lip smacking delights. Celestial Court, renown for serving Cantonese cuisine set in an opulence ambiance that reflects the grandeur of royals. Entering through its grand court set with swags of red drapery into a beautiful dining room filled with plush velvet red chairs, pristine white table settings, cream and gold panels with high ceiling. Executive Chinese Chef Vincent Loo and Dim Sum Chef Ken Liew have gone all out this festive season and whipped up several lavish menus of festive set, a la carte, Yee Sang, dim sum and desserts. Taking limelight this Chinese New Year is Celestial Court Boston Lobster Yu Sheng with Peach (RM50 per 100gm), a lavish platter of sweet lobster meat crowning the traditional Yee Sang and its classic ingredients. A treat perfect for the season, the lobster sashimi is beautifully represented in the obligatory Yee Sang. Besides the King of Crustacean, there are also the lux Yu Sheng with 20 Head Green Lips Abalone and Snow Pear in Traditional Style as well as Yu Sheng with Jelly Fish, Monkey Head Mushrooms and Banana in Plum Sauce. Soups are very important in any Chinese meal. During the festive season, soups are filled with lots of extra goodies. There’s plenty of delicious and nutritious soups this season. Savor the bountiful Thick Broth with Baby Lobster, Shredded Jade Abalone, Dried Scallop and Sea Cucumber (RM58). A thick bisque filled with chunks of prized seafood in superior soup is comforting in every spoonful. There is also a pretty and extravagant soup of Braised Superior Bird's Nest Broth with Assorted Seafood and Spinach (RM128 per portion). Delicate in flavours the spinach soup has subtle notes to match the fine bird nest. More glorious dishes to come and it was another prized platter of Braised 20 Head Green Lip Abalone with Goose Web and Sea Cucumber in Superior Brown Sauce (RM120 per portion). Goose web is such a premium delicacy and this one was treated with utter respect and cooked till gorgeously tender. The collagen in the gelatinous skin has a melt-in-the-mouth texture while the rich savory flavours have penetrated deep into the web. More collagen in the soft and light jelly textured sea cucumber and abalone added forms of various delightful textures to this dish. Enjoy this a la carte of in the set menu. The next seafood dish of Sauteed Fresh Scallop and Sliced Cuttlefish with Flower Fungus and Gardens Greens in a Spicy Beijing Sauce (RM168– small |RM242 – medium) won many hearts including mine. The tender and sweet scallops and crunchy cuttlefish is enrobed in an unctuous spicy sauce that whets the appetite for more. During this season, it is an ingredient that appears on every table. Signifying laughter of happiness, we savored the crustaceans in Duo Combination of Tiger King Prawn Deep Fried with Spicy Chili Salt and Sautéed with Sichuan Style (RM138 – small | RM208 – medium). The Sichuan sauce was piquant, lightly sweet and addictive while the spicy chili salt prawn heads was aromatic and very tasty. Noodles represent longevity and ours was a classic Braised Authentic E-Fu Noodle with Seafood, Dried Oyster and Bean Sprout in Abalone Sauce. The soft E-Fu noodles was eggy and scrumptious, having absorb all the flavours of the abalone sauce. The dried oysters added an intense smoky and briny note to the noodles, giving it a different flavour twist. FullCNY Festive Menu of Celestial Court are available here. Celestial Court is open for lunch from 12noon to 2.30pmm Mondays to Saturdays. On Sundays and Public Holidays, Dim Sum Bruch is served from 10.30am to 2.30pm. Dinner is served from 6.30pm to 10.30pm daily. Book your table by contacting 03 2727 9900 ext. 6933 or email restaurants.imperial@sheraton.com.